100% Full Load Burn-In Test, High Performance, High Reliability. Compact Size, 15% Smaller than Conventional Products. Most stepper drives require a separate DC power supply for operation. Omegamation offers two power supplies that are matched for use with our stepper drive selection: the OMPS150A24 and the OMPS300A48. Both power supplies are switched-mode, regulated DC power supplies with active PFC filters. The OMPS150A24 is 24 Vdc, 6.3 A (150 W) while the OMPS300A48 is 48 Vdc, 6.7 A (300 W). 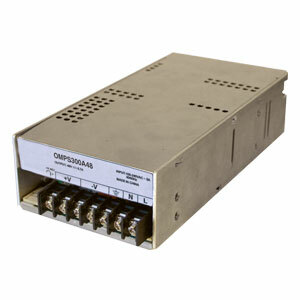 Protect your power supply from motor regeneration with the OMRC-050 regen clamp... see "Specs" above for details. 1 At maximum output power, nominal input voltage, Ta = 25°C (77°F). 2 Ripple and noise measured at bandwidth of 20 MHz by using a 12" twisted pair-wire terminated with 0.1uF and 47uF parallel capacitors. 3 Constant current limit with automatic recovery. Avoid operating at overload or dead short for more than 60 seconds. 4 Shutdown output voltage, manual reset. Re-power on to recover. 5 This power supply is considered a component to be installed in final equipment which should be re-confirmed to meet EMC directives.